Summer is in full swing, which means it’s time for beach days, outdoor summer camp, pool parties, and some extra time at the playground! Although the summer brings with it bright days and warm temperatures, perfect for enjoying some extra time in the sun with your kids, it also brings with it many safety risks such as dehydration and sunburn. 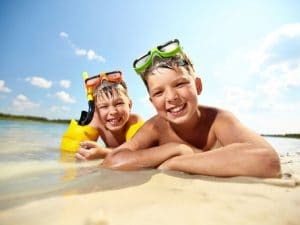 Read on to learn our top summer safety tips for kids, to keep you and your family happy and healthy this season. In the warm summer months, it is important to ensure that your kids stay hydrated as they play outside! Without proper hydration, these higher temps can lead to dehydration, heat stress, and even heat stroke. To keep hydrated, WebMD suggests drinking water at a minimum of every 20 minutes. Planning to be out in the sun for more than an hour? Experts suggest hydrating with electrolyte-rich sports drinks for even better dehydration prevention. Preventing sunburn is another important safety tip for summer to keep in mind while your children are having a blast playing on the beach, at the park, or in your backyard. One of the easiest ways to avoid sunburn is to limit outdoor time between 10:00 a.m and 3:00 p.m., when the sun is at its most powerful. If you are outside during these times, try to keep your kids in the shade when possible. Heading to the beach? An easy way to provide shade is by bringing an umbrella that incorporates SPF protection. When your family heads outside be sure to always use sunscreen, preferably SPF 30 or higher. Look for products that boast both UVA and UVB protection, and always apply 30 minutes before heading out for your day in the sun. In addition to being itchy and uncomfortable, bug bites can also lead to a variety of diseases including Zika, West Nile Virus, and Lyme disease. Ick! However, the good news is that there are a lot of effective insect repellants on the market that will allow your children to frolic outdoors without being eaten alive by mosquitoes and other pests. Experts suggest using a bug spray that includes DEET, which has been proven to ward off both mosquitoes and ticks. Pediatricians do not recommend the use of DEET on infants, however in children of two months of age or older, a product containing 10% to 30% DEET is recommended. warmer temperatures mean a variety of fun water activities, which can be a blast when enjoyed safely! One of our top summer safety tips is to always keep a close eye on your children when they are in the water. Another way to ensure your child stays safe in the water is to enroll them in formal swimming lessons and to invest in life vests for children that do not yet know how to swim. Want to take it a step further? You should consider enrolling in a local CPR class, so that you are prepared in case of an emergency. Looking for safe and fun summer activities for kids? We offer a fun-filled Santa Monica summer camp that places a strong emphasis on keeping safety first at all times. Our beach camp serves families in Santa Monica, Brentwood, Westwood, and the entire Los Angeles area. Contact us today to learn more about our safe summer camps that will allow your children to enjoy hours of fun in the sun this season!